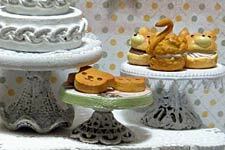 A mix of big bead caps to use as bases, and tops between 25mm and 30mm (most with fancy edges — or see the photos for a quick idea on adding Thin Looped Dresden as a lacy edge) to make miniature cake stands! Mix and match them as you want. The color doesn't really matter as you can paint the finished stand white (or use some Gilder's Paste to turn your creation an antiqued metallic color). Add more beads or bead caps to add more height. Enough parts to make 4 cake stands. 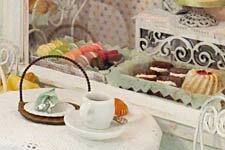 La Petite Patisserie by Shannon Cooper; See the Supply List.